Despite abhorrent rent hikes, showers in kitchens, rats bigger than small dogs who live rent-free in our apartments, overcrowding on the subway, overcrowding in parks, and overcrowding at Trader Joe's, we still manage to really, truly love New York City. Why? A huge part of it is the incomparable beauty you can encounter every day just walking down the street -- beauty that is somehow even more impressive than what you can find in our museums, stores, or, let's be honest, while eating a burger. 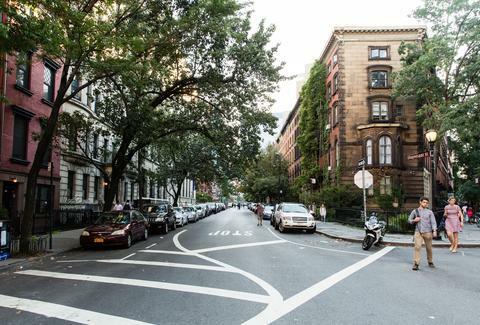 From Brooklyn Heights' historic Cranberry Street from Moonstruck, to the townhouses along 10th Street between 5th & 6th that you can't help but peer into as you pass, to the quiet charm of Marlborough Road in Ditmas Park, these are some of our favorite streets in New York City. 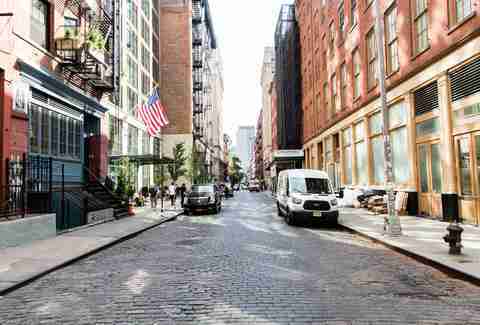 Minetta Street offers a welcomed respite from Greenwich Village's notorious crowds, tourists, and traffic. 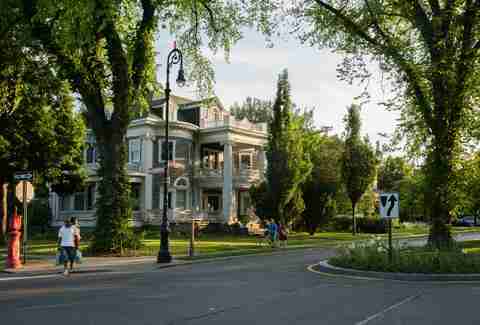 The quiet block has all the best of this town: 19th-century architecture, trees, peace & quiet, solitude… and a rich history you can't help but encounter as you walk the street's near-empty sidewalks. In the 17th century, the area was occupied by partially freed slaves who farmed and made their homes along a brook called "Mannette" that flowed into the then-pristine Hudson River. Construction workers in the 19th century covered the brook to make way for expansion -- but the bend in Minetta Street today hints at the water still flowing underneath. Minetta has survived many incarnations: shocking New Yorkers in the late 1800s with mixed-race saloons, brothels, openly gay bars, murders, and rampant crime; a 1920s renaissance of tenement tear-downs, building renovations, courtyards, and gardens; and a quiet, reposed era that turned the block into a popular filming location (Serpico, 13 Conversations About One Thing). And because all Greenwich Village locations partake in music history, Bob Dylan famously wrote "Blowin' In The Wind" in 1962 inside the old Fat Black Pussycat cafe -- now Panchito's Mexican Restaurant, visible in bright red in the above photo. Prospect Park West is peak Park Slope -- quite literally, as the neighborhood's cross streets run downhill from Prospect Park. But more than that, the park's western boundary has served as the backdrop for countless period pieces, including scenes from 2013's Wolf of Wall Street and 2014's Winter's Tale, thanks to its picturesque setup. 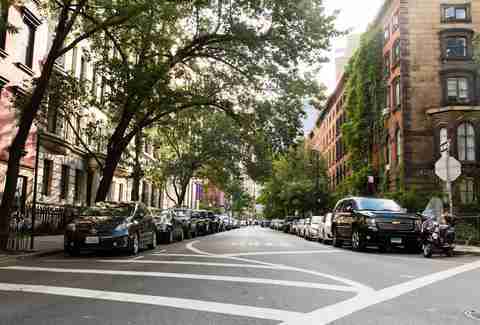 The leafy canopy on one side of the street offers natural shade and a quick respite from the busy city, while the multi-million dollar brownstones and apartment blocks on the other ooze sophistication without the snobbery of Central Park West. And at night, if you face north, you'll get just a peek of Grand Army Plaza's lights, a reminder of the grandeur of Gilded Age Brooklyn. Now that Brooklyn has been deemed an acceptable side-trip destination for NYC tourists (there are multiple Shake Shacks!!! ), everyone in the entire world has probably seen this photo in their Instagram feed: the Manhattan Bridge at sunset from Washington Street, with the Empire State Building jutting up beneath it, wedged snugly between the former's blue-gray iron legs... likely with ~50 people in front of it cluttering up the composition. Still, even locals can agree that there's just no better "gotcha" perspective shot in all of New York than witnessing these two architectural titans in the same frame, and no better place to appreciate both of them than Washington Street. Plus, Shake Shack's right around the corner. 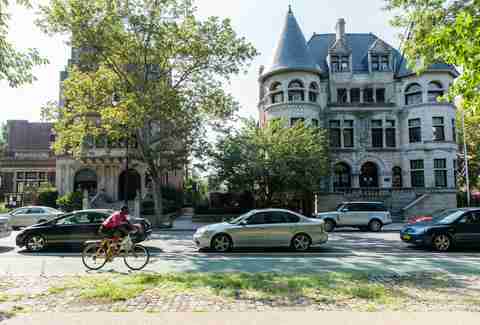 There's something about Riverside Drive that's so New York... which may be because the street and its surrounding neighborhood are featured in the greatest New York movie of all time, You've Got Mail. Riverside Drive starts on the south end of the Upper West Side at 72nd St and runs all the way up to Washington Heights, but the most beautiful section is close to the middle, in the 90s. Around 91st St, the two-way avenue splits and gives way to a narrow street that's bordered on the east side by regal apartment buildings, and on the west side by park plazas, which are essentially island extensions of Riverside Park dedicated to various statues (93rd St is home to Joan of Arc Island). The residential buildings and townhouses that line these cul-de-sac-like blocks are pre-war beauties with limestone, granite, and wrought-iron adornments, and though many are similar to what you'd find on the upper stretches of Park Avenue, these ones are actually on a park avenue. If you head north in Brooklyn Heights towards Dumbo, you’ll stumble upon the fruit streets: Cranberry, Orange, and Pineapple. Surprisingly, these aren’t part of a children’s TV show set -- they were named by Lady Middagh, who, according to NYC Parks, thought the street’s previous monikers were pretentious, as they were named after aristocratic families (she left her own name for Middagh Street, though, because a Lady’s gotta be a little pretentious sometimes). 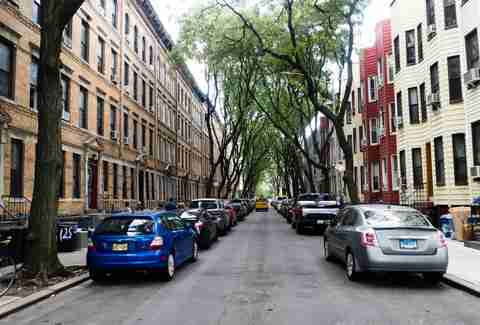 While it would be hilarious if a street named after something as darling as a fruit was actually a terrible place piled high with trash and ratkings, Cranberry is, of course, ridiculously charming -- a narrow street flanked with colorful brownstones cast in shade from tall trees. If you head down far enough, you’ll hit the Promenade, and can even have a real-life Cher-kicking-a-can-in-Moonstruck moment. On a street a few stops away from Times Square, the Empire State Building rises up in the background. No, you're not Downtown or Uptown or in Midtown -- you're not on that smelly island at all. 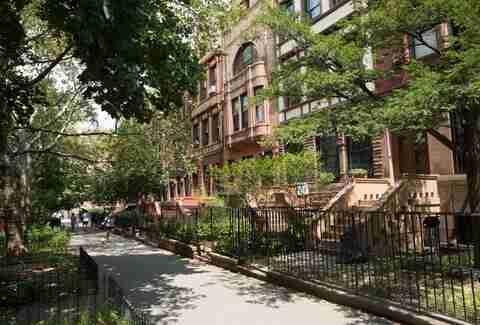 You're actually in Queens, about to take a walk through its nationally recognized Historic District, Sunnyside Gardens. While it might be one of the first planned suburbs in the country, you won't be finding any cul-de-sacs here. The whole area is inspired by the planned garden city movement that started in England in the early 20th century. That means that interwoven between the rows of red brick houses covered in ivy, you'll see grassy mews, shared courtyards, and yes, lots and lots of gardens. Just four blocks south from rowdy 14th Street, this peaceful respite lets you escape everything you’ve ever complained about in New York City. 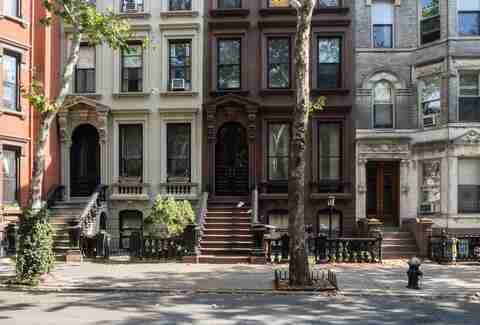 OK, you may wish you sold out to that tempting hedge fund job to one day be able to afford a brownstone on this beautiful, tree-lined street, but go ahead and adopt an empty stoop as your own (until someone kicks you out) and take in the steady flow of interesting characters. 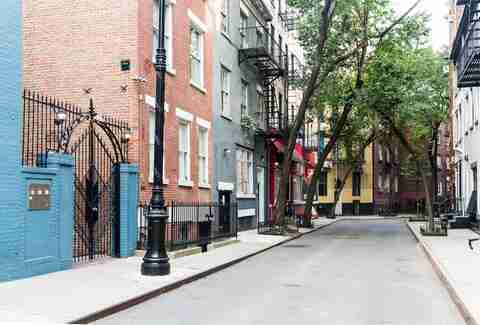 Protected by the Greenwich Village Historic District, this residential area harkens back to a time when notable residents like Mark Twain (14 W. 10th) and journalist Joseph Mitchell (44 W. 10th St.) lived here. Both ornate and simple homes line the block, many with plants creeping out windows or sprouting on rooftops, making it an urban oasis in the center of Downtown. 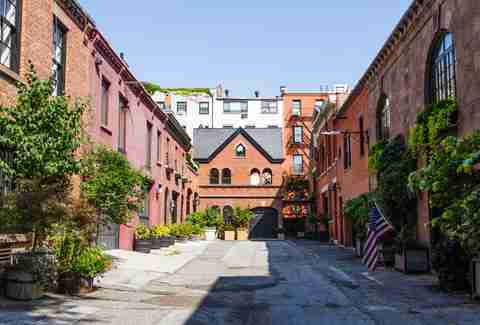 If you want a glimpse at SoHo that doesn’t involve dodging European tourists looking for the World’s Biggest Zara™, a stroll down the cobblestoned Crosby Street should suffice. What it lacks in big-name outlets, it makes up for in local (read: ridiculously expensive) boutiques, cafes, and bars. If you glance up, you’ll see abounding bohemian, pre-war architecture. If you look down, you might just see a celebrity (Leo!) in a black baseball cap trying not to be noticed, or a Cadillac commercial being shot in slow, steamy motion. It’s the quintessential NYC street that all wayward travelers dream of finding on their way to the Times Square M&M store. It just feels… secret, even though it’s definitely a public street. Best of all, it’s home to Thrillist. Your favorite website. But don’t come visit us. We have security guards. Marlborough Road, which runs north and south from the Prospect Park Parade Grounds until it dead-ends just past Foster Avenue, is a tree-lined, single-lane road that cuts through the middle of the western section of Brooklyn known as Victorian Flatbush (or the historic district of Ditmas Park, to get more granular about it). And it's just one of many neighboring roads that could stand to represent this weird little slice of suburbia. Argyle, Rugby, any number of cross streets -- they're all beautiful, because they're all flanked by giant candy-colored freestanding houses with massive wrap-around porches, columns, bay windows, stained glass, and lush green lawns. Built in the first decade of the 1900s, the Victorian, Colonial Revival, bungalow, and Queen Anne-style homes are kind of shocking in their singularity. One bike jaunt through the area and you'll forget that you're only a half-hour B/Q ride from the cesspool that is Manhattan. There’s a section off Hicks Street in Brooklyn Heights between Joralemon and Remsen where two short streets break off on either side -- that’s Grace Court, and Grace Court Alley (both are approximately the same length, but it’s clear which one is the “alley”). Grace Court boasts the church and fancy brownstones, and the end of the block overlooks the water, which may seem more alluring (skyline views! A polluted river! 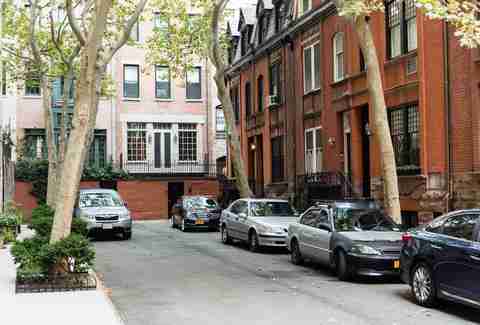 ), but Grace Court Alley is full of old New York history, as well as some pretty envy-inspiring architecture. The dead-end street (which is capped off by one very French countryside-looking carriage house) was originally a private family-owned horse stable, and got its name in 1847 after Grace Church was built across the street. Now instead of horses, the street is populated with multi-million dollar townhouses, most of which still sport old iron hay cranes. Though taking a walk down the alley may feel like you’re invading private property, the street is very much open to the public (and if a resident notices you lingering too long, just tell them very confidently that you’re looking for horse ghosts). 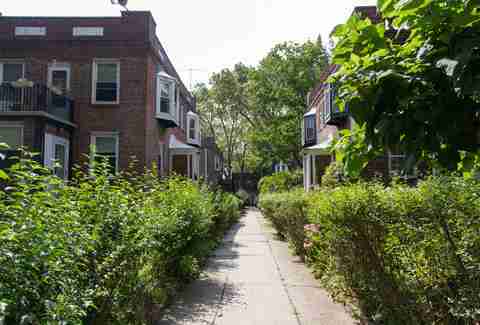 Just a few blocks from McCarren Park, Guernsey Street stands out as one of the most memorable blocks in Brooklyn, largely because of its very literal shade. 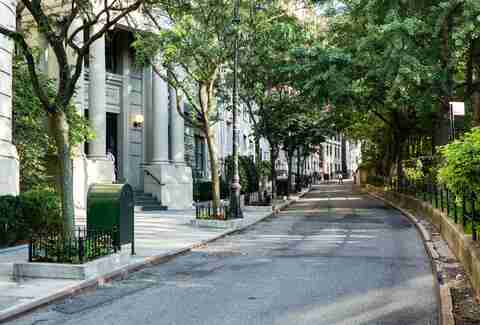 Flanked with colorful row houses covered by a natural tunnel-like canopy of locust trees, Guernsey offers a much-needed escape from the gray urban landscape of Manhattan and the crowded brunch spots surrounding the park. Wander down the street while you wait for your table at said brunch spot, and then explore the rest of the quaint area. Just don’t go into the post office -- you've been warned. 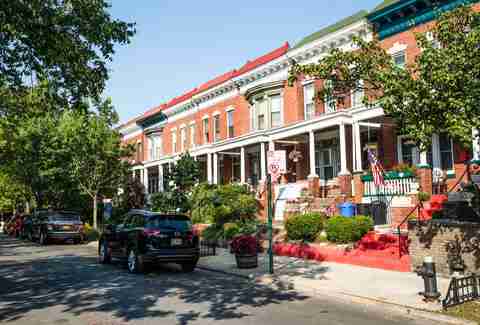 Cherry-red brick townhouses dating back to the 19th century line this quaint street located so far east you can almost feel the East River breeze. Practically plucked right out of a Connecticut suburb (except without the expansive lawns), this street that ends with a row of luxurious townhomes is the most suburban cul-de-sac in all of New York City. And it’s beautiful. Pretend you’re attending a potluck or a book club on the elite enclave to get a closer look at the 24 historic architectural jewel boxes, i.e. 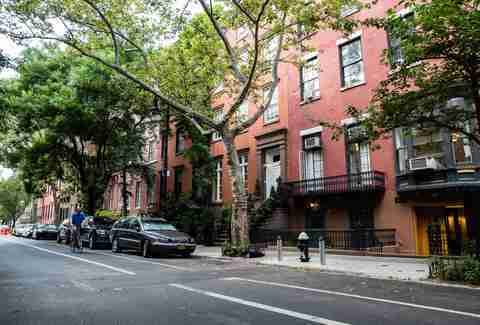 multi-million dollar homes, which harken back to an old, classier New York. There’s room for all of us on the wide-enough-to-fit-the-fanciest-of-baby-strollers sidewalks. Most of Brooklyn Heights looks like the world’s most adorable suburb (or Martin Scorsese's Boston) got transplanted to New York City, but Joralemon stands out in particular for its historic brownstones, Greek Revival-style rowhouses, and the cobblestone-paved street, which runs from Hicks straight down to the water. 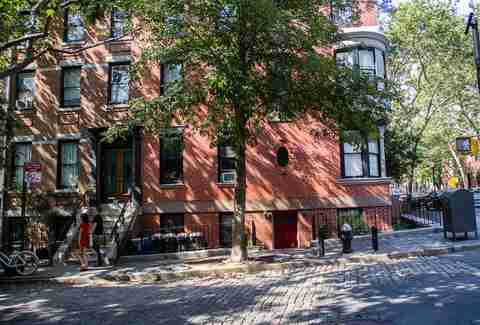 It’s the kind of street that you imagined when you were little and thought New York City looked like Martin Scorsese's Boston and that you'd totally be able to afford a brownstone one day. The single best, and weirdest, part about Joralemon, though, is that it’s home to a fake townhouse that serves as a subway vent and emergency exit (it’s lovingly referred to as the “Shaft House”). From the outset, Fuller Place looks like a lot of the streets that surround it in Windsor Terrace and nearby South Slope (rows of brick houses attached to one another, many with their own unique style of roof, bay windows, and front porch). But the thing that stands out about this quiet street the most (other than the fact that The Amazing Spider-Man was filmed there, and more importantly, the Geena Davis movie Angie) is a small row of homes that cap off the end of the street -- a rare sight in the city, and one that makes you feel like you've somehow escaped to the suburbs without leaving Brooklyn. If you’ve spent any time at all in the East Village, then you’ve noticed Stuyvesant Street -- one of the only diagonal streets in a city built on a well-ordered grid system. 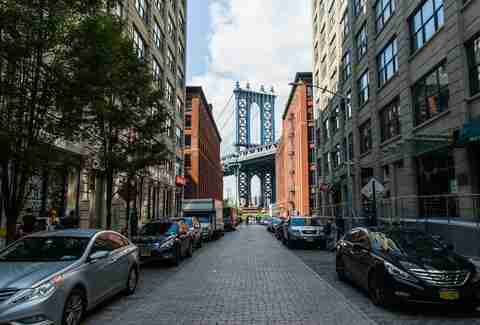 The street, which runs from 9th and 3rd to 10th and 2nd, has a rich history involving Peter Stuyvesant and his great-great grandson Petrus -- which includes the still-standing St. Mark’s Church in-the-Bowery and the Hamilton Fish House. 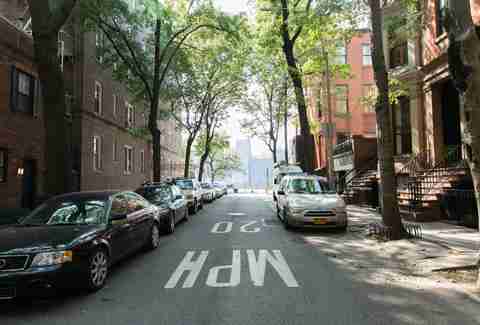 Today the street is best known for being that one weird block in the East Village with the crazy-looking corner. It’s also home to the perfect amalgamation of humans, with NYU Steinhardt students smoking cigarettes on one side of the street, and upper-class brownstone owners on the other (further down the block, in Abe Lebewohl Park, it’s an even more natural mix of crust punks and 16 Handles-toting dog walkers). But population aside, the best part of Stuyvesant is the fact that the street itself will always be different than anywhere else. There’s something magical about this section of North Greenpoint between Manhattan and Franklin Avenues; the way the light hits the top of the trees and stretches out to the river at sunset. The cozy feeling you get walking around a small town when in fact you’re in the middle of Brooklyn. The uninterrupted views of the Midtown Manhattan skyline from nearby Transmitter Park. Walking down this serene enclave off of Greenpoint Avenue makes you feel simultaneously at peace and envious of the block’s brownstone dwellers. In addition to being home to a smattering of different-colored townhouses you’ll fantasize about living in one day, Kent is also a stone’s throw from some of the best bars, restaurants, and shops in North Brooklyn (that you can maybe possibly already afford).